2016-05-01 ~ National Association of Postal Employees, Tirunelveli Division. Over the last two years, 72 officials have also been dismissed. Non-performance will no longer be tolerated: To drive home this Good Governance message of Prime Minister Narendra Modi, the Centre has ordered 33 senior officials of the revenue department to take premature retirement. PM Modi had been regularly receiving complaints from various departments about officials who were either indifferent or harassed the public. In January, PM Modi had asked all departmental secretaries to take stern action against non-performing officials during a meeting called “pragati interaction”. Secretaries were asked to draw up a list of officials who were non-performing as a rule. To scrutinise their records, the Department of Personnel and Training had written to the administrative officials of 34 departments seeking inputs. The government said they are working on an exercise to rotate officers working in sensitive posts to improve efficiency. Mumbai: Growing commerce in small towns is expanding the business of Speed Post - the express mail service from India Post. Despite dividend payments and annual reports moving to electronic transfers, Speed Post revenues have doubled in five years, partly due to e-commerce and also due to the postal department's near monopoly status in smaller centres. For the year ended 2015-16, Speed Post's revenue touched Rs 1,645 crore, an increase of 10% over the previous year, and the number of parcels shipped crossed 43 crore, which translates into 3,400 deliveries a minute considering the working hours. The average annual revenue growth over this five-year period has been 17.7%, probably the highest among the domestic express-courier services in the country. "Nearly 30% of business is now coming from small towns and mofussil centres," said P N Ranjit Kumar, postmaster general, Mumbai region. The department's business is concentrated among the top 15 cities. "Part of the reason is because printing and bulk mail is concentrated in some cities like Manipal," said Kumar. To tap new segments, the department is now offering services such as cash on delivery, SMS alerts, login id to corporate customers to track bulk articles and API (application programming interface) to e-commerce companies that allows them to get raw data regarding their consignments. "In coming years, we see express delivery being super-specialized. Customers will expect consignments to be delivered within a specific time frame in a defined location. This will be possible with postmen carrying hand-held devices. We are also introducing new technology such as parcel-vending machines," said Kumar. According to the Express Industry Council of India, the size of the country's express-courier segment is estimated at Rs 10,000 crore. The industry is expected to grow at 25% annually. The key drivers are seen to be e-commerce and the eventual passage of the Goods and Services Tax, which will bring down trade barriers within the country. The rails will come to a crashing halt on July 11. Railways minister Suresh Prabhu has requested Union finance minister Arun Jaitley for a financial assistance of about Rs 32,000 crore to absorb impact of 7th Pay Commission recommendations.“I would therefore earnestly request you to help the ministry of Railways and hand-hold it for implementation of 7th CPC recommendations,” Prabhu said in a letter addressed recently to Jaitley. “This may be done either through compensation of loss for coaching services (Rs 31,727 crore in 2013-14) or directly by virtue of a revenue grant matching the amount of the 7th CPC’s liability placed upon the Railways for the next three to four years.”Western railways employees union General Secretary Mr. Mahurkar said in a press conference in Nagad, if the recommendations of the railway minister Mr. Prabhu are not met or not accepted, the rails will come to a crashing halt on July 11.He added that about 1.5 lakhs of RPF jobs are vacant. He further reiterated, the security forces of railways work 24 hours, they should be paid accordingly, based on their commitment, which is not happening, he said. Railway Minister Mr. Prabhu has conveyed the grievances of railway staff to the finance minister Mr. Jitley, however it looks like he is in no mood to listen the plight of the railway staffs. so the employees are forced to take further devastative action, he added. In the 6th CPC the increase in the wages was 54% but the 7th pay commission has recommended only 14.3% increase. Its a crime against employees, he added.Mahurkar also objected to the implementation of new pension scheme for the employees from April 1 2014.He added, on 9th June we will issue a notice for strike, if our demands are not met, from 11th July the railway employees will go on indefinite strike. Dopt வெளியிட்ட Status Report : CRC Meeting held on 28/12/2015. Approval of MoS(PP) and FM has been obtained. Dept of Posts has circulated the draft note for the Cabinet. Comments of DoPT on Cabinet note has been sent to Dept of Posts on 06/04/2016. 1. Those who have completed 4 Years in Grade II will be considered for Grade III Promotion..
2. 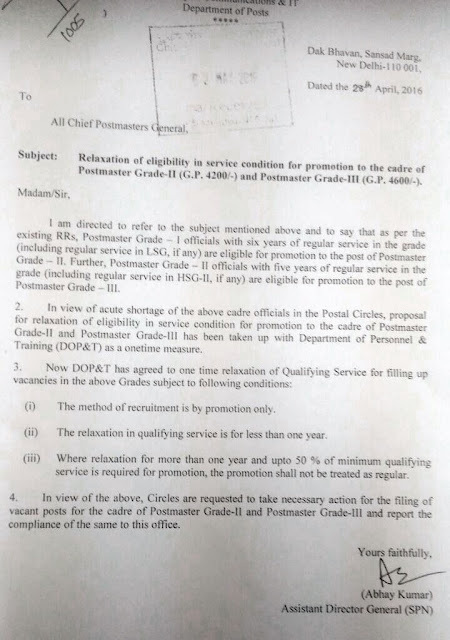 Those who have completed 2 1/2 years in Grade II will be posted as Grade III but shall not be treated as regular..
Introduction Of 'Same Day Delivery' Facility . Click here Download Dte letter. Only 1 Per Cent Indians Pay Income Tax – Over the last six years, the growth in the total income tax collected has slowed down considerably. Taxpayers account for just about one per cent of India’s population, but tax outgo was over Rs. 1 crore for as many as 5,430 individuals, as per the latest data disclosed by the government for assessment year 2012-13. As part of a transparency drive, the government has made public direct tax data for last 15 years. Data for individuals has been published only for 2012-13 assessment year, which shows taxes for income in financial year ended March 31, 2012. A total of 2.87 crore individuals filed income tax returns for that year, but 1.62 crore of them did not pay any tax — leaving the number of taxpayers at just about 1.25 crore which was close to one per cent of the country’s total population of about 123 crore at that time. The tax outgo was less than Rs. 1.5 lakh for a vast majority of nearly 89 per cent taxpayers (over 1.11 crore). Their average tax payable was just about Rs. 21,000, while the collective amount stood at over Rs. 23,000 crore. The three individuals in the top-bracket of Rs. 100-500 crore paid a total tax of Rs. 437 crore — resulting in an average tax outgo of Rs. 145.80 crore. As many as 5,430 individuals paid income tax of over Rs. 1 crore. Out of this, the tax range was Rs. 1-5 crore for more than 5,000 individuals, resulting in a total outgo of Rs. 8,907 crore. As per the overall data, total income tax collections rose nine-fold to Rs. 2.86 lakh crore in 2015-16, from Rs. 31,764 crore in 2000-01. The data further said that the bulk of individuals who filed returns for the assessment year 2012-13 earned an annual salary between Rs. 5.5 lakh and Rs. 9.5 lakh. Over 20.23 lakh taxpayers earned Rs. 5.5-9.5 lakh, while their cumulative salary earnings stood at Rs. 1.40 lakh crore in the financial year 2011-12. Further 19.18 lakh individuals earned salary of Rs. 2.5-3.5 lakh that year. Six individuals fell in the high-end earning bracket of Rs. 50-100 crore of salary income. In the salary range of Rs. 1-5 crore, there were as many as 17,515 individuals. Nearly 2.87 crore salary earners filed their I-T returns in assessment year 2012-13. The total number of individuals who paid income tax in 2011 was 4 crore; that number climbed only to nearly 5 crore for 2014. For the year 2014-15, Maharashtra collected the maximum direct tax (which includes corporate tax and individual income tax) of Rs. 2.77 lakh crore, followed by Delhi at Rs. 91,274 crore , Karnataka, Tamil Nadu and Gujarat. Over the last six years, the growth in the total income tax collected has slowed down considerably. The growth rate in the collection of taxes was nearly 18 per cent in 2010, down last year to about 6.7 per cent. (d) if so, the details thereof and the action taken thereon? (a) to (d): Suggestions have been received from time to time for relaxation of upper age-limit for widows. Relaxation of age up to 35 years (up to 40 years for members of Scheduled Castes and Scheduled Tribes) for the widows, divorced and women judicially separated from their husbands who are re-married for employment to Group ‘C’ and erstwhile Group ‘D’ post has been provided vide Department of Personnel & Training’s Office Memorandum No. 15012/13/79-Estt (D) dated 19.01.1980. Similar relaxation is provided for Group ‘A’ and Group ‘B’ posts except where recruitment is made through open competitive Examination vide Department of Personnel & Training’s Office Memorandum No. 15012/1/87-Estt. (D) dated 05.10.1990. From postal delivery to banking, the PMO has received complaints about almost all areas of service and governance. New Delhi:A few months after assuming office, PM Narendra Modi asked officials to fix an urgent problem: a six-fold jump in grievance mail was choking the PMO's response system, leading to delays running into several weeks in processing complaints that ranged from operation of Jan Dhan accounts to stuck patents.Getting rid of truckloads of redundant material was a start. The PMO created space for a staff of 50, a digital system for web filing of complaints, online transfer of petitions to central departments and SMS alerts for complainants. Even at 3,000 petitions a day, processing time came down to days. But as grievance redressal improved, data analysis revealed policy and design glitches — some of which threatened to undermine the efficacy of the government's ambitious welfare schemes — leading to interventions and course corrections aimed at addressing root causes for the complaints to pile up in the first place. A Jan Dhan account holder who deposited Rs 100 in a bank branch other than his "home branch" found Rs 29 deducted as cash handling charge. Realising that negative experiences could discredit the scheme itself, rules were clarified to ensure such levies were not charged from beneficiaries of the financial inclusion programme. Feedback about problems in postal deliveries led to a review of tracking of parcels, speed post and money orders and the introduction of a post information mobile app and SMS-based messaging. Similarly, the railways' refund system was tweaked and changes made to income tax and excise procedures to reduce hassles. Initially, a sharp rise in petitions took officials by surprise as the yearly average rose from 1.2 lakh complaints to close to 6 lakh between June 2014 and March 2015. The increase seemed driven by expectations generated by the Modi campaign's promise of "maximum governance" and perceptions of an empowered PMO. "The motivation came from the top with the PM seeking improvements. This led to re-engineering of processes that boosted efficiency with the same staff strength. The PM's 'Pragati' governance reviews helped and resulted in a superior rate of disposal. We are encouraging states to seamlessly integrate with our system," said Anurag Jain, joint secretary in the PMO. The change has been significant as disposal rate of central departments went up from 42 per cent in July 2015 to the current average of over 85 per cent. தேனி கோட்ட தேசிய சங்க மாநாடு 01.05.2016 அன்று போடிநாயக்கனுர் தலைமை அஞ்சலகத்தில் வைத்து நடைபெற்றது. கோட்ட தலைவர் திரு.வேணுகோபாலகிருஷ்ணன் அவர்கள் தலைமை தங்கினார். முன்னாள் செயலாளர் திரு.ராஜேந்திரன் அவர்கள் வரவேற்புரையாற்றினார். திரு விவேகாநந்தன் அவர்கள் தொகுத்து வழங்கினார். திருமதி சித்ரா அவர்கள் வரவு செலவு கணக்கு வாசித்தளிக்க விழா இனிதே தொடங்கியது. கோட்ட மாநாட்டின் சிறப்பு நிகழ்ச்சியாக கோட்ட சங்கத்திற்கென பிரத்யோக வலையதளம் WWW.FNPOTHENI.BLOGSPOT.IN - மூத்த உறுப்பினர் திரு வேணுகோபாலகிருஷ்ணன் அவர்களால் தொடங்கி வைக்கப்பட்டது . இவற்றை நடத்திட பெண்தோழியர்கள் தன்னார்வலர்களாக பொறுப்பேற்றுகொண்டனர். திருநெல்வேலி கோட்ட பொருளாளர் திரு இரமேஷ் அவர்களும் கலந்து கொண்டனர். மாநில சங்க கன்வீனர் திரு.திருஞானசம்பந்தன் சார்பாக தூத்துக்குடி கோட்ட செயலாளர் திரு N.J. உதயகுமாரன் அவர்கள் கலந்து கொண்டார். மாநாட்டின் இறுதியாக திருமதி சித்ரா அவர்கள் நன்றி கூற கூட்டம் இனிதே நிறைவுற்றது. 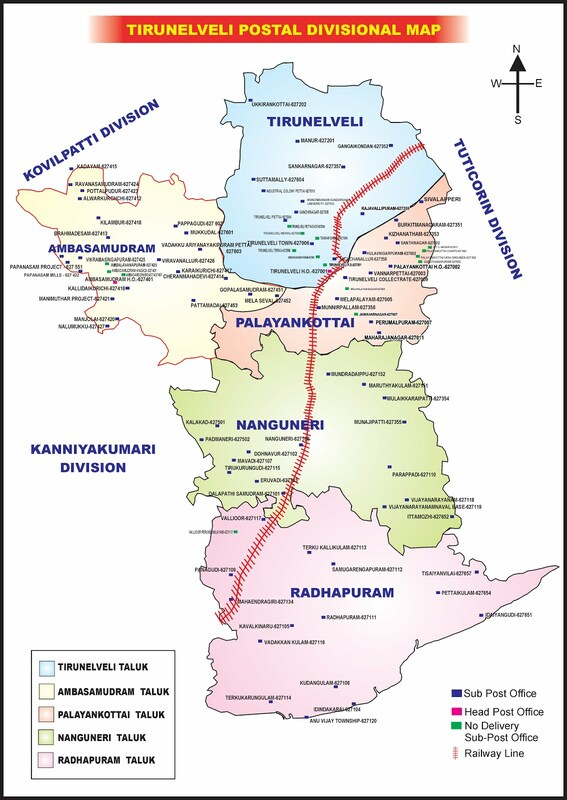 திருமதி.ராஜேஸ்வரி - கோட்ட பொருளாளர் ஆக தேர்தெடுக்க பட்டனர். DoP temporarily suspended booking of surface mail items to several foreign countries. உயர்வு எண்ணிகையில் அல்ல - எண்ணங்களில் வேண்டும். சுயமாக முடிவு எடுத்தாலும் சும்மா இருக்க மாட்டார்கள். 10 உடன் 11 ஆக இருக்காமல் தனித்து இருப்போம் நாம். தபால்காரர் & MTS பிரிவில் 5 புதிய உறுப்பினர்களும் நம்முடன் தேசிய நீரோட்டத்தில் இணைந்துள்ளனர் என்பதை மகிழ்ச்சியுடன் தெரிவித்து கொள்கிறோம். மே தின கொடியேற்றம் திருநெல்வேலி அஞ்சல் அலுவலகத்தில் 01.05.2016 அன்று காலை 0900 மணிக்கு நடைபெற்றது . நமது சங்கத்தின் முன்னாள் தலைவர் திரு.E.ஆனந்த ராஜ் அவர்கள் சங்க கொடியேற்றி மேதின வாழ்த்துரை ஆற்றினார்கள் . மேலும் நமது சங்கத்தின் P3 பிரிவு செயலாளர் திருமதி.S.சூரியகலா மற்றும் GDS பிரிவு செயலாளர் திரு.C.சரவண குமார் அவர்களும் மே தின உரையாற்றினார்கள் . திரு.குணசேகரன் உதவி செயலாளர் அவர்களின் நன்றியுரையுடன் விழா இனிதே நிறைவுற்றது . வாழ்க FNPO வளர்க FNPO . Happy May Day 2016: May Day is also known as International Workers’ Day or Labour Day in some places. May Day is declared as a national public holiday in many countries, but in some of the countries, it is celebrated specifically as Labour Day or International Workers Day. May Day is dedicated to all the hard worker, their achievements. It is the day to all of the labors who did their best in their work and struggled in the past when our country was ruled by the Britishers. On this occasion of May Day 2016, we convey our best wishes and regards to all the labors and workers around the world.